The partly excavated ruins of the ancient city of Volubilis preside over a fertile plain located approximately 22 miles (35 kilometers) north of the imperial city of Meknes. One of the best preserved ancient sites in Morocco, the ruins offer a fascinating insight into the city that once served as the capital of the kingdom of Mauretania, and later as one of the southernmost cities of the Roman Empire. Volubilis was founded by the Berber people in the 3rd century BC, and was part of Mauretania when the kingdom became a Roman client state following the fall of Carthage in 146 BC. In 25 BC, King Juba II was placed on the throne and began building his royal capital at Volubilis. Despite his Berber ancestry, Juba was married to the daughter of Mark Antony and Cleopatra, and his tastes were distinctly Roman. The city’s public buildings (including a forum, a basilica and a triumphal arch) reflect the architectural styles of Roman cities across Europe. In 44 AD, Mauretania was annexed by Claudius and Volubilis grew rich exporting grain, olive oil and wild animals for use in gladiatorial spectacles to the rest of the Empire. By the 2nd century, the city was one of the Empire’s most important outposts and boasted 20,000 residents. The wealthiest families lived in fine townhouses with spectacular mosaic floors. Volubilis was overrun by local tribes in 285 AD and never re-captured by Rome. Instead, the city was inhabited for another 700 years, first by Latin-speaking Christians and then by Muslims. In the late 8th century, it became the capital city of Idris I, the founder of the Idrisid dynasty and the Moroccan state. By the 11th century, however, the city was abandoned. The seat of power was relocated to Fez, and Volubilis’ residents moved to the nearby mountain village of Moulay Idriss Zerhoun. The ruins of Volubilis remained intact until the mid-18th century, when they were largely destroyed by an earthquake. In the following decades, Moroccan rulers like Moulay Ismail looted the ruins for their marble, which was used in the construction of several imperial buildings in Meknes. The ruins were only identified as those of the ancient city of Volubilis in the late 19th century, when they were partially excavated by French archaeologists. Throughout the French colonial period, the ruins were excavated, restored and in some cases, re-built. In 1997, Volubilis was inscribed as a UNESCO World Heritage Site in recognition of its importance as a finely preserved example of a large Roman colonial town on the fringes of the Empire. The excavated section of Volubilis is relatively small in comparison with the ancient city complexes of Egypt. However, the graceful columns and crumbling walls make for stunning photographs set against the backdrop of the Moroccan countryside, and wandering through the historic ruins is a humbling experience. Make sure to visit the triumphal arch, located at the edge of the ruins; the forum with its towering columns and what’s left of the city’s basilica. 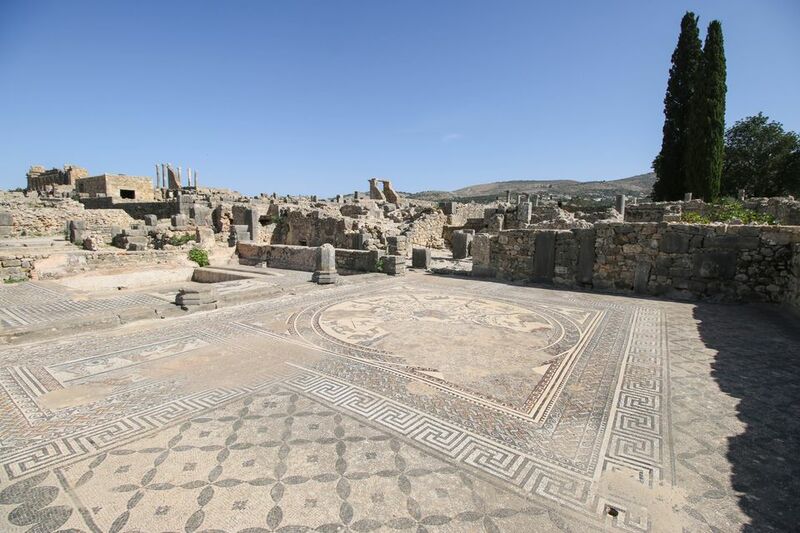 The highlight of a trip to Volubilis is undoubtedly its restored mosaic floors, all of which are on view in their original setting. The finest of these are located at the House of Orpheus, the largest and most beautiful of the excavated private houses. Here, you’ll find three stunning mosaics depicting Orpheus playing his lute to an audience of wild animals, a dolphin and Poseidon, the Roman god of the sea. The house also includes the remains of a private hammam, complete with hot and cold rooms and a solarium. The ruins at Volubilis are open every day from sunrise to sunset. You’ll need to pay a small admission fee of 20 dirhams, and official guides are available for hire at the entrance to the complex for 120 dirhams. Most people visit on a day trip from Meknes (22 miles/35 kilometers away) or Fez (50 miles/80 kilometers away). You can drive there yourself, or hire a private taxi from the train station in Meknes. If you’re visiting from Fez, it’s cheaper to take the train to Meknes and organize a taxi from there than to book a taxi from Fez itself. Alternatively, most riads and hotels in both cities offer organized tours to Volubilis. These usually include a stop at the mountain village and sacred pilgrimage site of Moulay Idriss. If you want to visit for longer than a day, you’ll need to book accommodation at Moulay Idriss, located just five kilometers from the Volubilis ruins. There are a selection of atmospheric guesthouses and B&Bs to choose from - including top-rated option Dar Zerhoune. Housed within a traditional Moroccan home, this B&B offers ensuite guest rooms, a restaurant that specializes in authentic Moroccan cuisine and a roof terrace with breathtaking views of Moulay Idriss and the ruins in the valley beyond. Guests can join daily walking tours from the B&B to Volubilis, passing through olive groves and local villages along the way. Volubilis is a worthwhile destination all year round, and there is no bad time to visit. However, the summer months can get incredibly hot, and there is little protection from the sun in the ancient city. If you choose to visit from June to August, make sure to bring plenty of water and sunscreen. The city is at its most picturesque in April and May when the surrounding fields are lush with spring wildflowers. For the best photographs, try to time your visit for early morning or late afternoon, when soft light gilds the columns of the ancient city with gold.